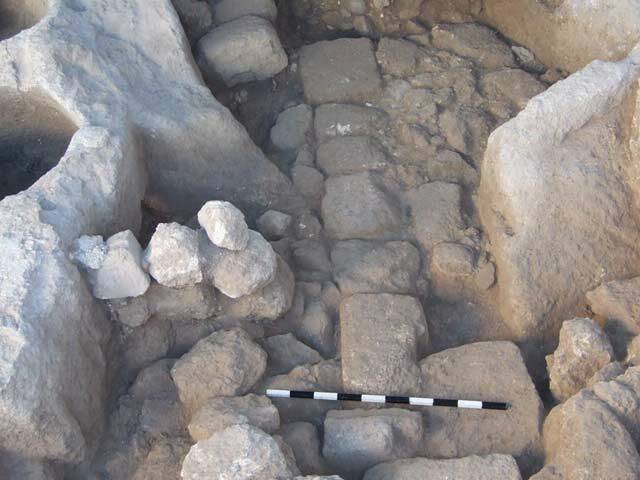 During July–August 2009, a small trial excavation was conducted on the summit of Mar Ya‘akub hill in the old Yafi‘a village (Permit No. A-5700; map ref. 226060/732612), prior to construction. The excavation, on behalf of the Israel Antiquities Authority, was directed by Y. Alexandre, with the assistance of Y. Lavan (administration), R. Mishayev and Y. Nemichnitzer (surveying), A. Peretz (field photography), D. Syon (metal detection and coin analysis), E. Belashov (drafting), H. Tahan-Rosen (pottery drawing), H. Rosenstein (metallurgical laboratory), N. Feig (identification of animal bones), Y. Gorin-Rosen (glass), and workmen from Mashhad. The old village of Yafi‘a or Yaf‘a is located on a limestone hill (354 m above sea level) in the Lower Galilee, c. 3 km southwest of the old village of Nazareth; the two form today a built-up continuum. Yafi‘a lies 7 km south of Sepphoris and an old track runs from the valley to the west of Yafi‘a, along the hill flank and directly to Sepphoris, by-passing west of the Nazareth basin. The main water source of the village is a spring, ‘Ein Sufsafa in the valley to the north of the Yafi‘a hill, which supplies the Bir el-Amir well at the foot of the hill. The village is identified with Yafi‘a or Japhi‘a, cited in the Bible as a settlement on the tribal border of Zebulun (Joshua 19:12), and also as Iapu, a vassal of Megiddo in the fourteenth century BCE Amarna letters (Abel P.F.M. 1938. Géographie de la Palestine II. Paris:255). Moreover, it is the large Jewish town of Yaf‘a or Iapha that is said to have been fortified with a double wall by Josephus in 66 CE, in preparation for the Jewish Revolt against the Romans; it suffered a defeat and a massacre at the hands of the Roman Tenth Legion in the summer of 67 CE, when the Roman army was engaged in the siege of Yodefat (Josephus War 2.573; 3.289; Life 45.230; 52.270). The original village nucleus is located on a steep soft limestone hill, known as Mar Ya‘akub; a still-standing stone church of this name commemorates the late, possibly sixteenth century, Franciscan tradition of Yafi‘a as the birthplace of the apostles James and John, the sons of Zebedee (Fig. 1). A partially collapsed three-story underground complex of ten bell-shaped silos or granaries was visible near the Latin church in the middle of the village in the 1870s, as well as another simpler silo complex, and in 1869, a jar with 200 Roman imperial coins was found in one of these silos (Guérin V. 1880. Déscription Géographique, Historique et Archéologique de la Palestine, I. Paris:104; Conder C.R. and Kitchener H.H. 1881. 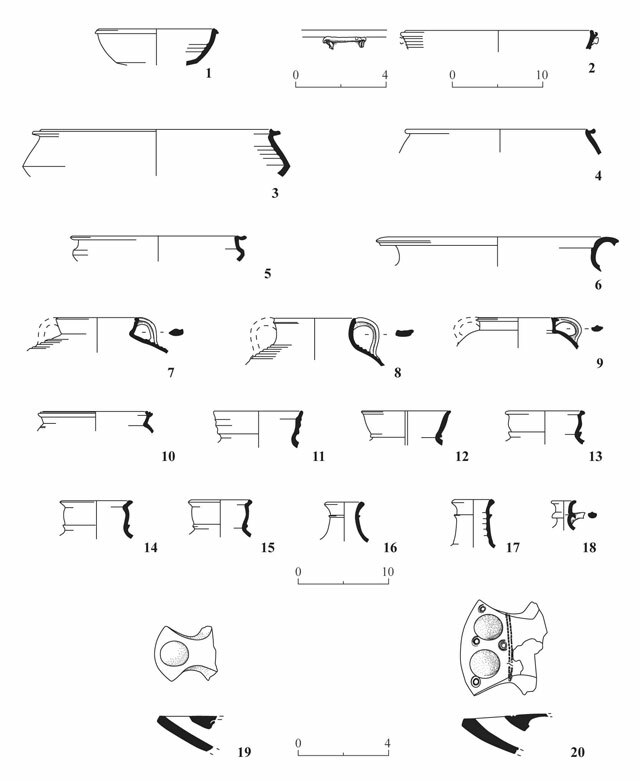 Survey of Western Palestine I. London:353–354; Fig. 1: 1, approximate location). Vincent published two stone lintels in 1921, one exhibiting a menorah and the other two winged eagles, which he observed in secondary use in the village, as evidence for an ancient synagogue in Yafi‘a (Vincent L.H. 1921. Vestiges d’une synagogue antique à Yafa de Galilée. RB 30:434–438), and in 1950, Sukenik excavated on the hill the remains of a west–east oriented Late Roman to Byzantine synagogue with a basilica plan (c. 15 × 19 m; Fig. 1: 2). He exposed two rows of pedestals, a Corinthian capital and a colorful mosaic floor with geometric designs and a circle depicting the remains of two of the twelve tribes, or of the zodiac circle (License No. C-5/1950; Sukenik E.L. 1951. The Ancient Synagogue at Yafa near Nazareth. Preliminary Report. Bulletin of the L.M. Rabinowitz Fund 2:6–24). Today, very partial and poor remains of the synagogue are still visible beneath a modern house. 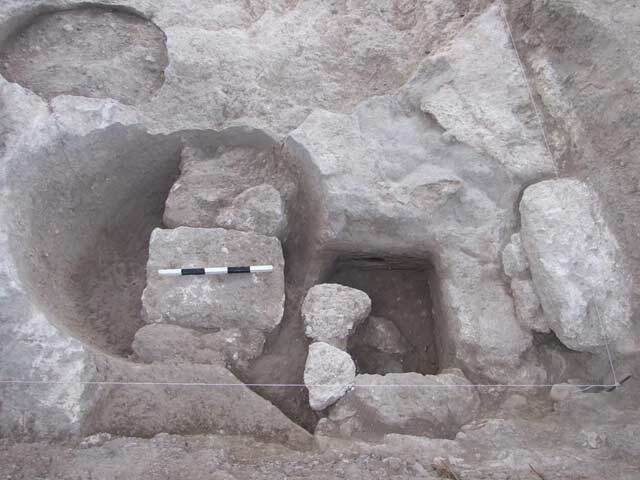 Six small-scale salvage excavations have been carried out over the last twenty years, subsequent to the exposure of archaeological remains in the course of development works. 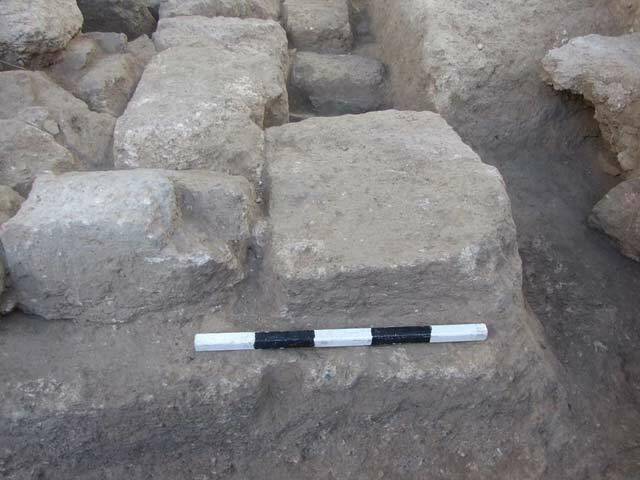 These excavations uncovered a stepped miqwe (ritual bath; Fig. 1: 3; ESI 20:131*), several burial caves with kokhim from the Roman period to the east of the hill (Fig. 1: 4–6; ESI 20:24*–25*; HA-ESI 110:25*, 26*), crushed chalk floors of the Late Bronze and Iron I periods near the top of the Mar Ya‘akub hill (Fig. 1: 7; M. Cohen, pers. comm.) and limited building remains from the Byzantine and Mamluk periods (Fig. 1: 8; HA-ESI 114:110*). At the outset of the present excavation (28 sq m; Fig. 1: 9), a 0.5 m layer of modern debris and garden soil was removed by a backhoe. A single square was opened and evidence of two main periods of occupation and activity were exposed. The earlier Stratum II dated from the Late Hellenistic to the Early Roman periods (first century BCE–first century CE) and the later Stratum I dated to the Late Roman period (fourth century CE). In addition, scattered Iron II potsherds evinced an earlier Iron Age (late tenth to ninth centuries BCE) occupation in the vicinity. The quarrying activities of Stratum I considerably damaged the earlier Stratum II remains. No architectural remains could be attributed to this period. Several potsherds of Iron II were found in the accumulations and fill in the later silos (L109, L110) and in the surface fills (L102, L103). These potsherds probably reflect an Iron Age occupation in the immediate vicinity, rather than in the rock-hewn pits. The bedrock was exposed at a depth of 0.3–0.5 m beneath the ground surface; in the western half of the square, three rock-hewn silos whose upper parts had been cut away by later quarrying ,were exposed (Loci 105, 109, 110; Figs. 2, 3). It is fair to suggest that these silos had once been basement elements located beneath contemporaneous houses, whose remains were entirely removed by later activities. Silo 109 (max. diam. 1.73 m, opening diam. 1 m, depth 1.7 m; Fig. 4) was a carefully-hewn bell-shaped pit, with a slight carination in the lower sides and a small uneven cut-out niche toward the top, possibly for placing a stick to aid the descent into the pit (Fig. 3: Section 1-1). On the basis of other Galilean comparisons, the pit probably originally narrowed up to a smaller circular opening (estimated original dimensions, diam. of opening 0.6 m, depth c. 1.9 m). The pit was found completely filled with soil and stones. Directly above the bedrock floor of the pit was a damp layer of grayish soil, overlain with a thicker layer of brownish soil that contained some ash and a sheep/ goat bone; closer to the opening the fill incorporated many large building stones. No living surface was observed in the pit, but the bottom layer (thickness c. 0.8 m) contained several Iron Age potsherds, above which Early Roman potsherds predominated, with some occasional Late Hellenistic ones. Three Late Roman coins found with a metal detector in the adjacent dump may have come from the upper fill of this pit. Silo 110 (including L113 and L117; Fig. 3: Section 2-2) was a deeper rock-hewn pit (depth in excess of 2.7 m), and its bedrock floor was unfortunately not reached. The silo was bell-shaped, with a circular opening (opening diam. 0.92 m, max. diam. in excess of 2 m). As in Pit 109, the top of Pit 110 was probably also hewn off by the later quarrying and the original opening may have been narrower (diam. 0.5 – 0.6 m; Fig.5). An opening hewn in the eastern side of the pit was also the result of later quarrying activities. The pit was filled with brown earth, incorporating several building stones in the upper layer. The lowest layer (L117) was damp and contained many small chalk chips and some Early Roman potsherds; the layer above it (L113; thickness 0.8 m) contained significant quantities of ash, a few cattle bones and sheep/goat bones with evidence of butchering, as well as many Early Roman sherds, including a knife-pared double-nozzled lamp (see Fig. 11:20) and several small fragments of Early Roman glass vessels. Directly overlying Layer 113 inside the pit was a thin clayey living surface (L110; elevation 352.7 m), incorporating small chalk chips, charcoal and organic material, as well as some cattle, sheep/goat and chicken bones. On this surface lay burnt potsherds of an Early Roman cooking pot, two knife-pared lamp nozzles, other potsherds, charcoal, seeds and three chalk-stone vessel fragments (see Fig. 13:1–3). 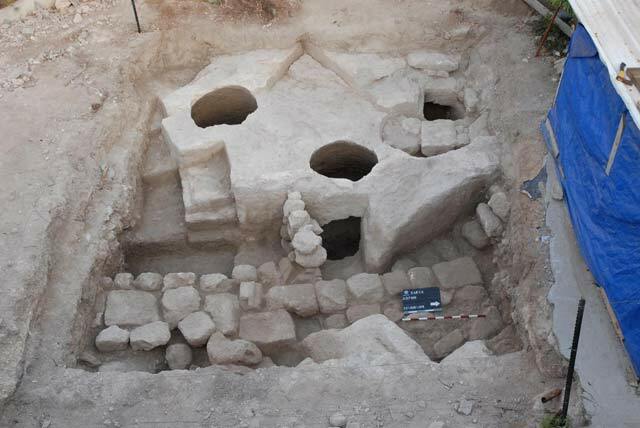 The finds clearly suggest that cooking and other activities took place inside the pit. Two coins dating to Alexander Jannaeus (104–76 BCE), one in L113 and the other in L110, were also found in the pit. The upper layer in Pit 110 (353.2 m above sea level) consisted of loose earth fill and contained some potsherds, roughly worked stones and two coins, dating to the Late Roman period (mid-fourth century CE). Silo 105 was much shallower than the former two and had the form of an open basin (Figs. 3: Section 3-3, 6). Originally, it was also bell-shaped and hewn at a higher level, aligning with the natural bedrock that sloped down from north to south. The later quarrying activities hewed off most of the pit, retaining only a basin (max. diam. 1.4 m, height 0.8 m). The blocking up of Silo 105 with large worked stones and some earth fill belonged to the later Stratum I. Very few potsherds were found. Attached to Silo 105 was a square-shaped rock-cutting that at first appeared to be a trough. However, when its blocking stones were removed, it turned out to be a narrow (0.6 m) vertical shaft, with a deep vertical step (L106; Fig. 7) that led down into a rock-hewn chamber (L114). The entrance into this chamber was only partially cleared and the excavation did not continue into the underground chamber, as the area lay beyond the excavation limits. A stone slab roofing the chamber was visible from the inside, but could not be examined. The small quantity of loose brown earth fill removed from Shaft 106 and Chamber 114 contained both Early and Late Roman potsherds, a few small fragments of Late Roman glass vessels, and thirteen coins, all dating to the mid-fourth century CE. The mixed nature of the finds suggests that the chamber may have been hewn in the Early Roman period, but was also in use in the Late Roman period. The quarrying activities at the site are attributed to Stratum I. After the silos were no longer in use, and probably after they mostly filled up, the bedrock was exploited for hewing large limestone building stones. In the middle of the excavated square a deep vertical step (depth 0.4–0.8 m) with an uneven line was cut into the rock surface (Fig. 8). This step also cut a hole into the eastern wall of the earlier Silo 110, and a very small wall (W112) that consisted of two courses of small stones was built next to this new opening, suggesting that some secondary use may have been carried out in the upper layers of Silo 110. A deep step (c. 0.4 m) with an uneven line was also cut into the bedrock on the eastern side of the excavation square, forming a strip (width c. 1–2 m) between these two steps, where the bedrock surface was cut lower and clear cutting lines of quarried stones were visible (L115, L116). Subsequently, this lower bedrock step was filled with two or three layers of various sized building stones, probably rejects, placed in rows side by side, which seem to have been laid so as to raise the surface level of this lower step to the height of the surrounding bedrock (L107, L108). Additional shallower angled rock-cuttings were noted all over the bedrock surface, and it is evident that these cuttings were the negatives of stone quarrying activities that postdated the earlier Stratum II occupation (Fig. 9). A few Late Roman potsherds found in the earth fill between the stones permit dating the quarrying and the filling with stones to the Late Roman period. Above the stones and earth fill was a chalky layer (L102), probably a living surface containing a few mixed potsherds, a single second–third century CE coin and two coins of the fourth century CE. The underground rock-hewn silos and cavities contained c. 170 indicative potsherds, including 15 dating to Iron Age II, 22 dating to the Late Hellenistic period, 125 to the Early Roman period, and only eight from the Late Roman period. The Iron Age: The indicative potsherds dating to Iron IIA–B were mostly found in Silo 109, with a few in Silo 110. The pottery included several ridged-rim cooking pots (Fig. 10:1), an orange-colored ware, holemouth jar (Fig. 10:2), and several storage jars, including a ridged-neck 'hippo' storage jar (Fig. 10:3). The limited pottery is characteristic of Iron IIA–B pottery forms at sites in northern Israel, dating to the late tenth and ninth centuries BCE, within the period of the Northern Kingdom of Israel. The Late Hellenistic Period: The Hellenistic potsherds comprised mainly cooking pots and storage jars. The assemblage included a single fine red-slipped Eastern Terra Sigillata fragment (Fig. 10:4), a buff-colored mortaria bowl (Fig. 10:5), some short-necked globular cooking pots (Fig. 10:6), several buff-colored ware bag-shaped storage jars with thickened square or more rounded rims (Fig. 10:7, 8), a few light brown bag-shaped storage jars with more tapered necks (Fig. 10:9, 10) and a single high-necked table amphora (Fig. 10:11). This limited repertoire is dated to the late second and early first centuries BCE. The Early Roman Period: The mass of potsherds, which comprised mostly cooking pots and storage jars, is consistent with well-known Early Roman assemblages; many of the cooking pot forms are known from Kefar Hananya (Adan-Bayewitz D. 1993. Common Pottery in Roman Galilee. Ramat Gan). The potsherds included bowls of Kefar Hananya Form 1B (Fig. 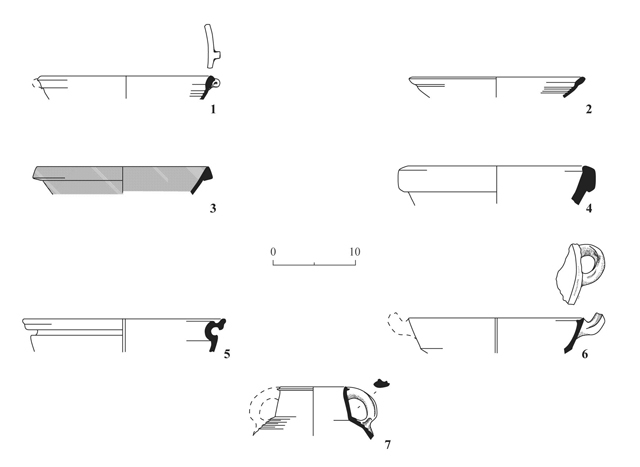 11:1, 2); a few open cooking pots or casseroles with rounded profiles of Kefar Hananya Form 3A (not illustrated); cooking pots with carinated sides (Fig. 11:3, 4) that are not a Kefar Hananya form, a single example of the slightly later Kefar Hananya Form 3B cooking pot (Fig. 11:5); several Early Roman 'Shikhin' type kraters (Fig. 11:6); some closed cooking pots that are similar to Kefar Hananya Form 4A (Fig. 11:7); a cooking pot of pink ware, found on the living surface (L110), with a different taller neck and an external ridge at the rim, which is also not a Kefar Hananya form (Fig. 11:8) and cooking pots of Kefar Hananya Form 4B (Fig. 11:9, 10). Although the vessels were not tested petrographically, on the basis of the forms and the appearance of the wares, it is probable that some of the cooking vessels were manufactured at the Kefar Hananya production center, located c. 32 km away, while others were produced at another, possibly closer cooking ware production center. All the storage jars are bag-shaped, exhibiting two different neck and rim forms: the sloping-out square neck with a tapered rim, similar to Fernández' Type T1.3 (Fig. 11:11, 12) and the neck-ridged type with a gutter on the inner rim, similar to Fernández' Type T1.5 (Fig. 11:13–15; Diéz Fernández F. 1983. Cerámica Commún Romana de la Galilea: Approximaciones y differencias con la ceramica del resto de Palestina y regiones circundantes. Jerusalem and Madrid). The former jar type has an earlier chronological span (first century BCE–second third of the first century CE), and the latter—a later span (first–early second centuries CE); the two types seem to overlap around the second third of the first century CE. In addition, a variety of Early Roman jugs and juglets is present (Fig. 11:16–18), a couple of knife-pared nozzled lamps, and one with a double nozzle (Fig. 11:19, 20). Although the ware of these lamps was not analyzed, they were probably manufactured in Judea. On the basis of repertoires known from other sites in the central Lower Galilee, some of these vessels have a chronological range covering the first century CE, others from the late first and throughout the second centuries CE. It seems that all these vessel types were in use in the decade of 60–70 CE. The Late Roman Period: The few Late Roman indicative potsherds came mostly from the earth fills (L103, L104) overlaying the stone layers (L107, L108), as well as from the fill layer above the floor in Silo 110. These included two bowls of Kefar Hananya Form 1E that were found in the fill in Silo 110 (Fig. 12:1, 2) and may have penetrated into the pit via the opening cut by the later quarrying; a bowl of Late Roman Cypriote Red Slip Ware Type 1 or 2 (Fig. 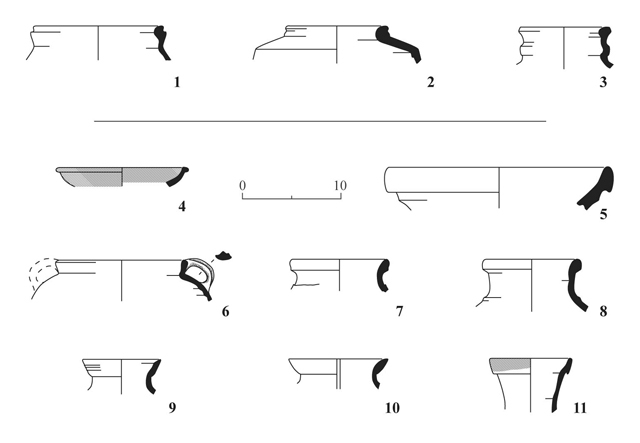 12:3); a coarse ware basin bowl (Fig. 12:4), a Late Roman ‘Shikhin’ type krater (Fig. 12:5), a horizontal-handled casserole (Fig. 12:6) and a cooking pot with a high-neck and a ridge rim (Fig. 12:7). Most of these pottery forms have comparisons in the house of Dionysos at Sepphoris, in the destruction level attributed to the earthquake of 363 CE (Balouka M. 2004. The Pottery from the House of Dionysos. In R. Talgam and Z. Weiss. The Mosaics of the House of Dionysos at Sepphoris [Qedem 44]. Jerusalem. Pp. 39–45). 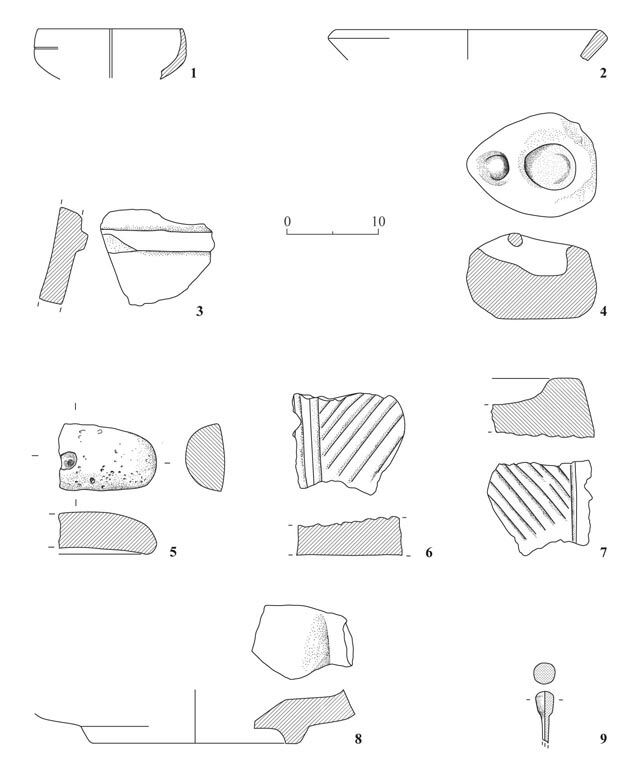 Early Roman Chalk Vessels: Fragments of five soft chalk vessels were found in Silo 110 (Fig. 13:1–3). The chalk stone bowls and cups date to the Early Roman period and are characteristic of the Jewish population, reflecting a concern for ritual purity. An unusual soft chalk artifact was found in the surface fillwithout a clear stratigraphical context (Fig. 13:4). It looked rather like a crude oil lamp, although it showed no signs of use. Basalt Grinding Implements: A basalt fragment of a loaf-shaped upper grinding stone, found at the bottom (L117) of Silo 110 is characteristic of the Iron Age (Fig. 13:5). Two other basalt grinding stones, found in the bedrock quarry areas, are fragments of Olynthus hopper rubber mills, one an upper and the other a lower stone (Fig. 13:6, 7). These milling stones were in use in the Hellenistic and Roman periods. A fragment of a basalt basin with a ring base was also found (Fig. 13:8). Bone pin: A small piece of a bone pin came from the stone fill of the quarry (Fig. 13:9). Three of the 26 recovered coins are completely unidentifiable. The remaining coins are very common to their respective periods. Coins of Alexander Jannaeus (104–76 BCE), and especially the type found in this excavation (star/anchor; Nos. 1, 2) are commonly found in much later contexts, including the Jewish War and even the fourth century CE. Here they fit nicely with both the Early Roman material in Silo 110 and with the Late Hellenistic pottery. The other very common coin is the Late Roman ‘Virtus Spearing Fallen Horseman’ type (Nos. 6–22); although this is a ubiquitous type, it appears here in a rather unusual concentration, practically excluding other types of the period. As ten out of 17 such coins come from L114, it may be possible to label them as a small hoard. Despite the extremely small-scale of the excavation, the exposed remains contribute to our knowledge of the history of settlement at Yafi‘a in three distinct periods. The Iron IIA–B potsherds are evidence for a late tenth to ninth centuries BCE settlement on the hill. This presumably was the Iron Age settlement of Yafi‘a in the tribal allotment of Zebulun in the Northern Kingdom of Israel. The Late Hellenistic pottery reflects the renewed settlement at Yafi‘a at the end of the second or the beginning of the first centuries BCE. The identification of the new settlers as Jews from Judaea is supported by the similarity of some vessels to Judaean pottery forms from the Hasmonean period and possibly by the Hasmonean coins of Jannaeus, although these may have arrived in the course of the first century CE. This Jewish identity is further supported by the continuity of settlement into the Early Roman period, when the pottery repertoire aligns entirely with the pottery repertoires of other Jewish villages in the Lower Galilee, and by the presence of the soft chalk vessels. The rock-hewn bell-shaped silos with small circular openings are also characteristic and even identical to Early Roman silos found in other Jewish villages in the Lower Galilee, for example in neighboring Nazareth and in Karm er-Ras in Kafer Kanna, the site identified as Cana of Galilee (HA-ESI 120). 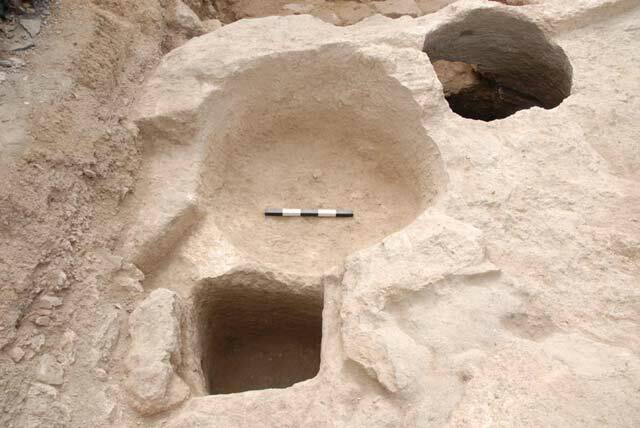 Moreover, the silos uncovered are of the same rock-hewn bell-shaped type as the silos in the three-storied silo complex seen by the early researchers in Yafi‘a in the late nineteenth century. Both these silos and some elements of the three-storied silo complex may originally have been hewn out as basement granary pits in Early Roman houses, but it is evident that they were adapted into hiding complexes in preparation for time of war, to conceal supplies, and if necessary, people. 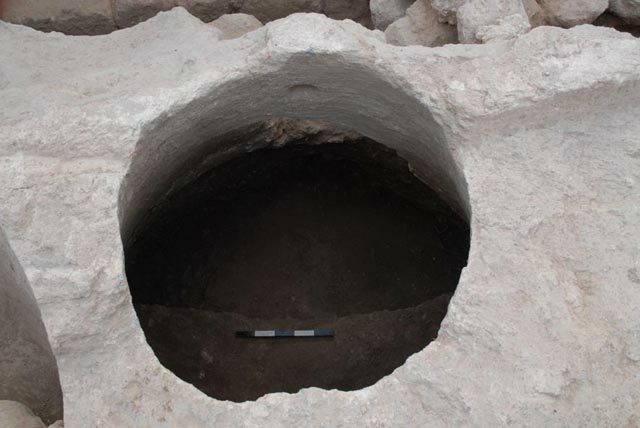 The burnt cooking pots and the organic material observed in the Yafi‘a silos is clear evidence that these hiding places were indeed pressed into service, almost certainly at the time of the Great Revolt of the Jews against the Romans in 67 CE. Some of the Jewish population of Yafi‘a would no doubt have hidden in these tight hiding places at the time of the battle and the massacre of the Jews by the Romans. There was almost no evidence for activity at the site in the second and third centuries CE, a possible reflection of the aftermath of the village destruction by the Romans in 67 CE. 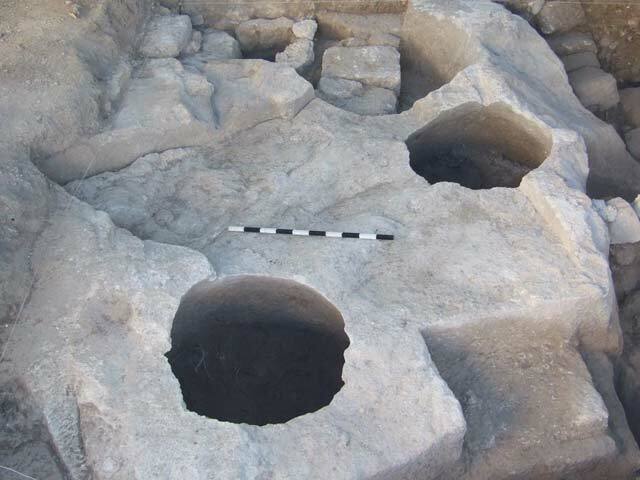 The quarrying activity at the site, dated on the basis of both pottery and coins to the fourth century CE, indicates that renewed building activities were undertaken in the village. The synagogue excavated by Sukenik is located c. 100 m from the excavation site and at a lower elevation on the hill; its construction was dated on stylistic considerations to the Late Roman period. It is a feasible suggestion that the ashlars quarried at the top of the hill may have been used to construct the synagogue of Yafi‘a. 1. 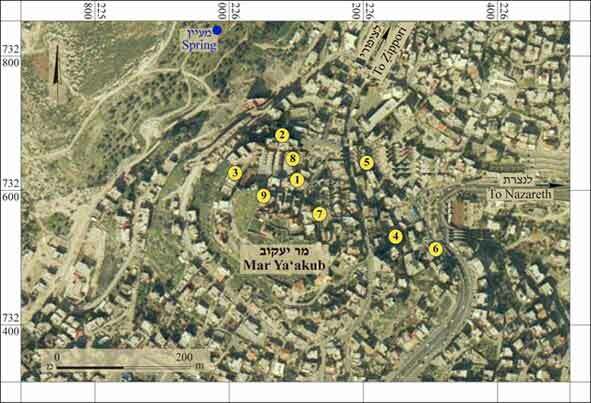 Aerial view of the Mar Ya‘akub hill, the excavation site (9) and earlier excavations (1–8). 4. Silo 109, looking north. 5. Silo 110, viewed from above. 6. Silo 105 and the adjoining Shaft 106, looking east. 7. Silo 105 and Shaft 106 at the end of the excavation, looking east. 8. The stepped quarry and the stone fill, looking north. 9. Building stones, partially hewn and partially still attached to the bedrock, looking north. 13. Chalk vessels, basalt grinding stones and a bone pin.